Note you may want to watch the entire show from the start including the music, animations and build up. Students of Glanmire Community College will get to have a live Amateur Radio link up with the International Space Station as it passes over Cork. Monday 23rd October 2017: It will be a case of one small step for man, one giant leap for the students of Cork Education and Training Board school, Glanmire Community College, this Thursday 26th October, when they make history as one of two Irish schools who will make direct radio contact with the International Space Station (ISS) while in orbit. 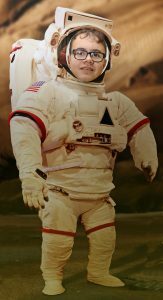 This once-in-a-lifetime opportunity is part of the Amateur Radio on the International Space Station programme (ARISS), which will see pupils of both Glanmire Community College and Tallaght Community School partake in a conversation with American astronaut Joe Acaba while he orbits the Earth. During Expedition 52 and 53, Acaba and the rest of the crew on the ISS will be traveling at 27,600 km/h South West from the New York horizon towards Italy and Poland and for 6 to 12 minutes will be passing directly over Glanmire Community College. In order to carry out this real-time Earth-to-space radio contact, which uses amateur radio equipment to beam a line-of-sight signal to the ISS, the school will set up a temporary radio station on the grounds which will include an antenna, two radio systems and a back-up line diverted via Belgium or Italy, in case of interference locally. Such a connection will allow students to speak directly with the astronaut while he takes a break from his duties and experiments on board the ISS. 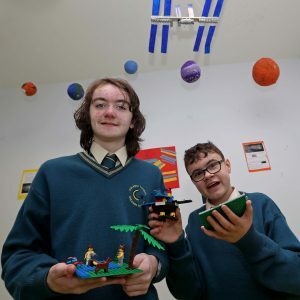 As the space station flies closer to Glanmire Community College, the connection and audio feed will become stronger and clearer. In fact, at one point during this fantastic feat of broadcast engineering, the ISS will be 400km in the sky directly above the school. As if this feat of engineering was not impressive enough, in order to allow another international school to take-part is this momentous occasion, Glanmire Community College, from their temporary radio base at the school, will bounce their signal off another satellite to allow the Romanian school, Calistrat Hogas located in Piatra-Neamt to take part in this contact. The students of both schools will take it in turns to ask the astronaut questions, with the answers to all questions being broadcast in both schools. The Irish students have the honour of kicking-off the questions with American astronaut Acaba. This exciting space contact is taking place this Thursday 26th October. The event lead-up will start at 9.45am with a Q&A with a panel of space exerts, space themed entertainment from Glanmire Community College Choir along with a wide range of other activity. The actual contact with the ISS is scheduled to take place at 10.50am. This amazing feat is being made possible thanks to the help of a number of individuals and groups, including ARISS; a global voluntary group that formalised a programme for utilising radio equipment on-board the ISS as a channel for further educating schools across the world on the work of the international space programme, life on-board the ISS, expeditions undertaken by astronauts and amateur radio. The latter is a hobby that facilitates the learning of how radio technology works, communicating with others and investigating the mysteries of long-distance communication. This highly-competitive programme, from which the lucky students of Glanmire Community College will benefit greatly, receives thousands of applications from schools across the globe. The application process opens every 6 months, enabling schools to apply to be chosen as one of the select few to make space contact six or 12 months later. Schools in the home country of the specific astronaut on a given expedition, which in this case is that of American Joe Acaba, normally receive 70 percent of the limited number of these contact events a year and so for countries such as Ireland, it is a huge honour to be chosen. 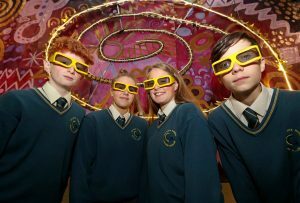 After applying for the second time to this amazing science programme, Cork ETB’s Glanmire Community College was thrilled to be successfully chosen this year due to the quality of their education application proposal, which showcased their innovation in the area of science and particularly space science, putting them light years ahead of competing schools. Their jam-packed education plan, which has been integrated into students’ curriculum over the past six months in preparation for event take-off, also set them apart from other competitors. In anticipation of this momentous experience, the school and its students have been partaking in a series of events and activities, such as a visit from the Blackrock Observatory Stardome mobile planetarium. The school also launched a space-themed competition, which invited entrants to submit questions intended for the American astronaut during contact. 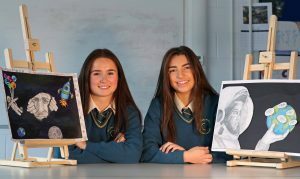 Other departments within Glanmire Community College have also become involved in the preparations, with art students taking part in a competition sponsored by Merck, The Science of Art, in which students created gorgeous art pieces inspired by the stars and planets above them. The results of this hotly contested competition will be announced at the ceremony on Thursday. There is also heavy involvement from individuals outside of the school, with students from the Film Department at St John’s College planning an on-location shoot during radio contact, in order to capture the moment of communication between Cork and outer space. Séamus McCague, National Co-Ordinator for the ARISS programme, was equally as enthused about the exciting events set to occur at Glanmire Community College. Commenting on the momentous occasion, he said, “The enthusiasm of both staff and students for the project is overwhelming. It is a wonderful opportunity for them to experience the practical application of space dynamics and radio communication. The fact that the Irish ground station will also allow another school outside Ireland to speak with the ISS shows the truly international reach of amateur radio which is of described as the greatest of all scientific hobbies”. This historic event will be live streamed on www.tog.ie, so that members of the public can also tune in. To stay updated on the journey of the students of Glanmire Community College you can follow them on Facebook\ Glanmire-Community-College or Twitter @GCCGuidance. Cork ETB was set up under the Education and Training Boards Act and is one of 16 Education and Training Boards (ETBs) to take responsibility for the delivery of primary, post primary and further education in line with their predecessor VECs (Vocational Education Committees). The Cork board is responsible for 25 post-primary schools and colleges, the Cork ETB School of Music, Music Generation Cork City, the impressive Cork Training Centre (Bishopstown – www.corktrainingcentre.ie), and three of the largest PLC colleges in the country, namely Cork College of Commerce, St. John’s Central College and Coláiste Stiofáin Naofa. The Board is also responsible for youth services, including Youthreach, projects for disadvantaged youth, Young People’s Facilities & Services Funds and grants for youth initiatives. For further information on Cork Education and Training Board (CETB) and their wide range of schools, courses and opportunities see www.corketb.ie. T-3 DAYS AND COUNTING FOR CORK STUDENTS TO MAKE HISTORY. Pictured are Muireann O’Connell and Jade Star Murphy. Students of Cork Education and Training Board’s Glanmire Community College gear up to make history as some of the first Irish students to make direct contact with an astronaut on the International Space Station (ISS) as it orbits the Earth via Amateur Radio. This historical space contact will take place as the ISS passes directly above the school this Thursday 26th October. To stay updated on the journey of the students of Glanmire Community College you can follow them on Facebook Glanmire-Community-College or Twitter @GCCGuidance, at Glanmire Community College, Brooklodge, Glanmire, Co. Cork. Pictured are Brian O’Connell, Lucia O’Callaghan Saoirse Desmond and Josef Coy. 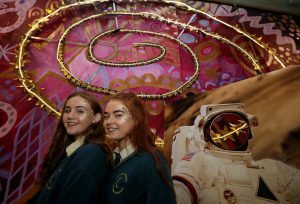 Students of Cork Education and Training Board’s Glanmire Community College gear up to make history as some of the first Irish students to make direct contact with an astronaut on the International Space Station (ISS) as it orbits the Earth via Amateur Radio. This historical space contact will take place as the ISS passes directly above the school this Thursday 26th October. To stay updated on the journey of the students of Glanmire Community College you can follow them on Facebook Glanmire-Community-College or Twitter @GCCGuidance, at Glanmire Community College, Brooklodge, Glanmire, Co. Cork. Pictured is Isaac Power. Students of Cork Education and Training Board’s Glanmire Community College gear up to make history as some of the first Irish students to make direct contact with an astronaut on the International Space Station (ISS) as it orbits the Earth via Amateur Radio. This historical space contact will take place as the ISS passes directly above the school this Thursday 26th October. To stay updated on the journey of the students of Glanmire Community College you can follow them on Facebook Glanmire-Community-College or Twitter @GCCGuidance, at Glanmire Community College, Brooklodge, Glanmire, Co. Cork. Pictured are Paul Hodge and Isaac Power, in the Glanmire Community College ASD Unit. 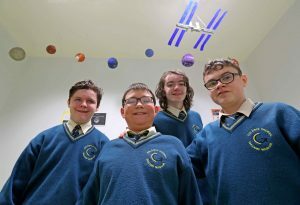 Students of Cork Education and Training Board’s Glanmire Community College gear up to make history as some of the first Irish students to make direct contact with an astronaut on the International Space Station (ISS) as it orbits the Earth via Amateur Radio. This historical space contact will take place as the ISS passes directly above the school this Thursday 26th October. To stay updated on the journey of the students of Glanmire Community College you can follow them on Facebook Glanmire-Community-College or Twitter @GCCGuidance, at Glanmire Community College, Brooklodge, Glanmire, Co. Cork. Pictured are Shane Gunnigle, Sameul Williams, Paul Hodge and Isaac Power, in the Glanmire Community College ASD Unit. Students of Cork Education and Training Board’s Glanmire Community College gear up to make history as some of the first Irish students to make direct contact with an astronaut on the International Space Station (ISS) as it orbits the Earth via Amateur Radio. This historical space contact will take place as the ISS passes directly above the school this Thursday 26th October. To stay updated on the journey of the students of Glanmire Community College you can follow them on Facebook Glanmire-Community-College or Twitter @GCCGuidance, at Glanmire Community College, Brooklodge, Glanmire, Co. Cork. 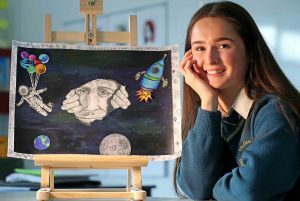 Pictured are 6th year students, Zoe Littlejohns, with her Merck Art of Science Competition entry, Peering through from the Past and Donna, Kerrigan, with her Merck Art of Science Competition entry, Newgrange to New Frontiers to New Perspectives. Students of Cork Education and Training Board’s Glanmire Community College gear up to make history as some of the first Irish students to make direct contact with an astronaut on the International Space Station (ISS) as it orbits the Earth via Amateur Radio. This historical space contact will take place as the ISS passes directly above the school this Thursday 26th October. To stay updated on the journey of the students of Glanmire Community College you can follow them on Facebook Glanmire-Community-College or Twitter @GCCGuidance, at Glanmire Community College, Brooklodge, Glanmire, Co. Cork. Pictured is Zoe Littlejohns, 6th year student with her Merck Art of Science Competition entry, Peering through from the Past. 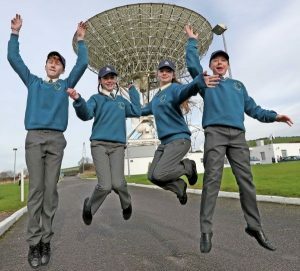 Students of Cork Education and Training Board’s Glanmire Community College gear up to make history as some of the first Irish students to make direct contact with an astronaut on the International Space Station (ISS) as it orbits the Earth via Amateur Radio. This historical space contact will take place as the ISS passes directly above the school this Thursday 26th October. To stay updated on the journey of the students of Glanmire Community College you can follow them on Facebook Glanmire-Community-College or Twitter @GCCGuidance, at Glanmire Community College, Brooklodge, Glanmire, Co. Cork. This was written by zg3409. Posted on Monday, October 23, 2017, at 8:03 am. Filed under Space, Uncategorized, Video. Bookmark the permalink. Follow comments here with the RSS feed. Post a comment or leave a trackback.